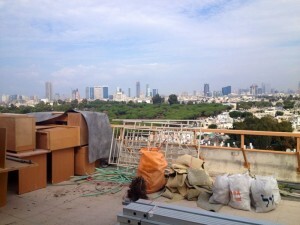 Newshound Media: live broadcast studio in Tel Aviv. Newshound Media is excited to announce the building of a brand new studio. We are redesigning the space to fit our needs so it is currently under construction, but we wanted to give you a sneak peak of the view! 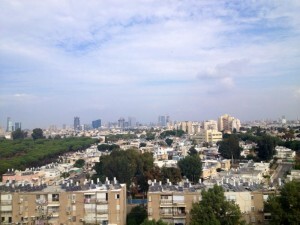 Located in Tel Aviv, we have a fantastic view of the city skyline as well as the Mediterranean Sea. The expansive balcony spans the length of the studio, and will be great for filming stand-uppers and interviews. It might look a little inside-out at the moment, but Paula envisions an open space for the producers, and a large studio for plenty of lives. Though there's a lot left to be done, we will be moved in time to ring in 2014 and we can't wait!